Sometimes my husband loves to experiment in the kitchen. Always with meat, as that is his area of specialty and thankfully it is almost always a winner. And I am happy to sit back and let him do the cooking too. Since he works nights, we have a lot of freezer meals during the week. It means he has meals for work and I don’t have to fuss too much getting dinner ready with a toddler and new baby in the house. So weekends are a great time to have a big cook up, with one of the most recent meals on rotation being the beer can chicken. Personally I never thought to try. It looked hard and I don’t drink beer. But if my hubby can do it, it mustn’t be too tricky at all. He’s great with cooking roasts and BBQing, but his cooking skills don’t go too much further than that. Yet of the few times he has made this for the family now, it has turned out great, as he has perfected his recipe. The open beer can inside the chicken helps keep the meat moist and infuses extra flavours through the chicken… don’t worry. It tastes nothing like beer! (Although some of you maybe wish it did). Wash chicken and pat dry. Rub with butter. Mix dry ingredients in a bowl and rub onto chicken. Tip out half a can of beer (or drink it if you can’t stand the thought of precious beer going to waste) and pierce the top of the can in several places. Stick rosemary sprigs into can. 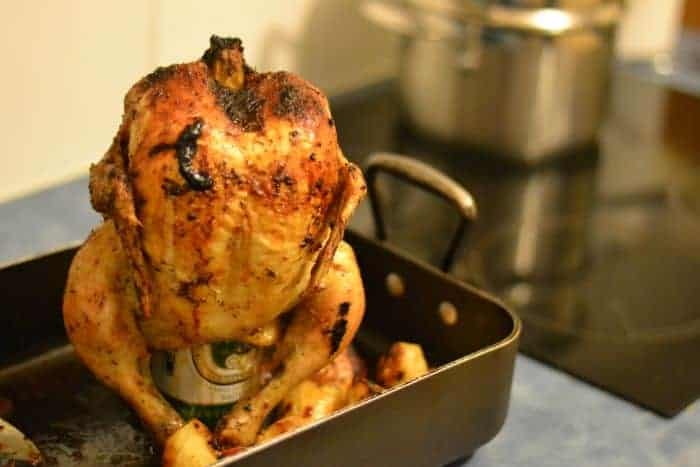 Sit chicken onto beer can inside roasting dish. Cook for approximately 60-80 minutes, or however long needed based on chicken size. Serving suggestion: Serve with roast vegetables, rice or any other sides of your choosing. This recipe falls into the budget recipe ideas and is a great budget friendly option for a roast dinner. Plus an excuse for someone in the household to finish off half a can of beer before dinner if they so please. But trust me, you won’t want to drink the beer left over after the chicken is cooked. Pretty gross, so you will have to sacrifice that half a can. What you will get is a very moist, full flavoured roast chicken the whole family will enjoy. 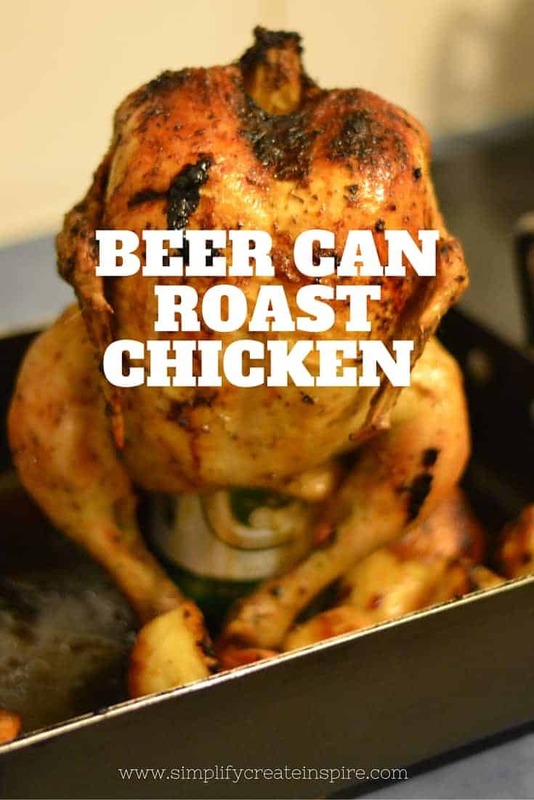 What would your serve with your beer can chicken? Hahahaha no I wouldnt think that you would want to drink the beer afterwards! I’ve always heard of this but you’ve convinced me (or should I say, my hubby!) to give this a go! Chicken fat and beer… 2 things I don’t ever want in my drink haha this is seriously hubby proof! Haha I just hear this as if someone is saying Bacon Chicken in a Jamaican accent! Will be leaving this open where hubby can see it. Look yum!!! Hahaha no Jamacians in this house. But always beer ? I’ve seen this recipe a few times now and really am intrigued – I think it’s one I’ll also have to get my hubby involved with! Make sure you pop back to let me know how it went ?